From Colorado Coin to BRLNCoin to Moksha Coin, Bounties is using event-specific tokens to galvanize the worldwide Ethereum community. The Ethereum ecosystem is growing and we are working as a key cog in its development. Knowing there is a great deal of unexposed talent in regions where hackathons are not the norm and blockchain communities are still young, we wanted to get involved as soon as ETHIndia was announced. As we started working on the BRLNCoin for ETHBerlin, the ETHIndia organizing team got in touch and we started ideating around a dApp environment to serve India’s burgeoning blockchain community. One of the drivers for The Bounties Network is levelling out the playing field when it comes to access to opportunity from anywhere in the world. ETHIndia will be held in Bangalore in August, and it represents a great opportunity for high impact community engagement. Discovering the potential Indian developers have to contribute towards a decentralised world and appealing to a diverse audience, the Moksha Coin will serve as a conductor of sustained collaboration between communities, individuals and larger scale projects. By symbolising liberation, self realization, inclusivity & accessibility, we know the Moksha Coin will be the token to transform the Asian Ethereum ecosystem. We’ve talked about of the benefits of having a live decentralized application on Ethereum before, and offering people the chance to interact with the blockchain and earn their very first tokens in the process. Bringing the digital into the physical, bespoke bounty networks allow for hands on interaction and education. The Moksha Bounties Network will be a blockchain bounty network built using our StandardBounties Protocol. It will use the ERC20 Moksha Coin (MOKSHA) for all reward payments and will form the framework for community incentivization and organization during ETHIndia and beyond. The protocol is open source and enables anyone to create their own bounty network transacting in ETH or any other ERC20 token. The environment will run on the Ethereum Rinkeby Testnet and is focused on promoting engagement and activity on the blockchain. Following the same format we designed for ETHBerlin, a variety of bounties will run including Onboarding and Community bounties, all funded with MOKSHA coins. We’ll also create a bespoke leaderboard to keep track of all coins transacted throughout the hackathon, so competition will certainly ensue! Onboarding Bounties are a key part of the experience and aimed at helping new users walk through the basic steps to get set up on the Moksha Bounties Network. a) Submit a screenshot of your first posted bounty. 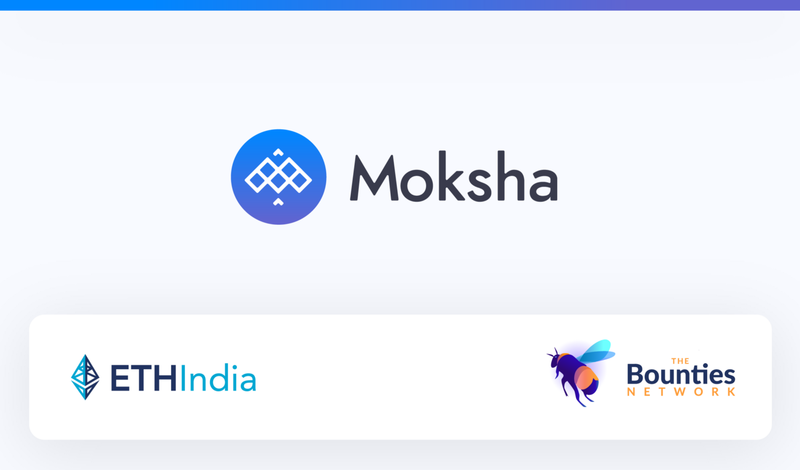 Moksha.bounties.network will go live ten days before ETHIndia, on the 1st of August. We will be launching a series of intro bounties to get you into the Moksha spirit. Stay tuned for an early-bird chance to earn your first MOKSHA. Subscribe to our emails for project status updates, join the Bounties Slack community for news and follow us and ETHIndia on Twitter. Bounties on any task, paid in any token on Ethereum.